When you eat Healthy, you are always Happy and your body is always Healed. This blog will give you tips to a wholesome, eco-friendly and happy life. 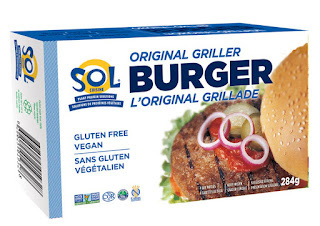 This has become my favourite vegan burger (mostly because all of the other brands either have refined sugar or carrageenan in the ingredients list). I love that I can just microwave it and it's done. It's an easy - but healthy - solution for a quick weekday meal. Perfect for a busy professional like me. It tastes really good. And the taste, quality and size of the patties have stayed consistent with time (unlike some other health foods - more on this later). I used to be able to find the family pack reasonably easy (and on sale) but I think they only make it in the summer. I try to buy the 4-pack on sale too, since it is still a bit expensive. For my microwave, I have to use 1:30 minutes instead of the 1 in the instructions - but that isn't too hard to do, and not too far from the instructions. It's also a Canadian brand, so that's one more good reason to buy from them. I really love this product. The only thing that could make this better is if it were Organic. I try to only eat Organic, but I also love burgers. So until I have the time/patience to make burgers myself with my own Organic ingredients (or someone starts selling Organic burgers), this will have to do. For now I will continue buying this product. Welcome to my healthy, eco-friendly and wholesome living blog! After overcoming crippling physical and mental health issues, I have turned my life and body around by eating wholesome foods, using toxic-free cosmetics and striving to live in harmony with the Nature around me. Many people ask me how I stay so fit, how I resist sugar cravings, how I haven't even caught a cold in 2 years, etc. So I decided to start this blog to help others live Healthy, be Happy and stay Healed. I hope some of my tips and recipes can inspire you to eat healthier and live in closer harmony with the Nature that surrounds you.